Lately I’v e been brushing up on my soufflé making skills. I’m one of those who love eggs, and I am relieved to be rid of the considerable guilt that egg consumption carried with it for many years. Science has once again determined that eggs are not the great culprit that we feared. The cholesterol scare has subsided and The Good Egg’s reputation is repaired – if not elevated. For the record, blood cholesterol levels are more affected by the saturated fats consumed rather than by cholesterol itself. 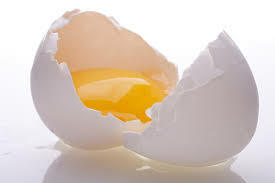 Those fatty phospholipids in the humble egg only further serve to diminish the absorption of the yolk’s cholesterol. Since most of the yolk’s fat is of the non-saturated variety many health professionals now take the stance that regular egg consumption does not affect the average person’s blood cholesterol level. Sunday Brunch. 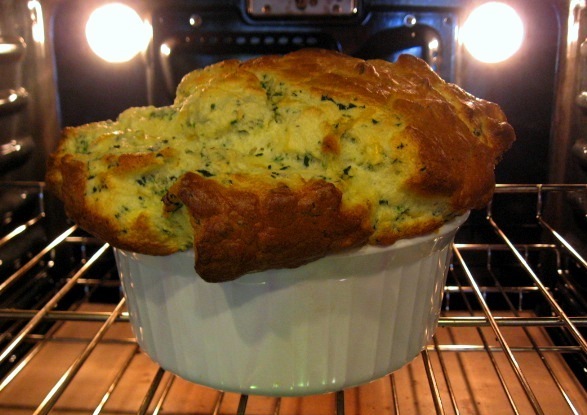 A soufflé was the obvious solution this weekend when deciding what to do with an over-abundance of fresh spinach. Now that I’ve gotten my ratios and rhythm down on soufflé making, the results have been pretty spectacular. Problem is, I’ve been so concerned with savoring its fragile beauty that getting photos has been a secondary issue. This time I was prepared, but the result may look strange… since the soufflé was still in the oven. I wasn’t taking any chances. Another Reason to Celebrate. Not only did we have a delicious soufflé, but we also had beautiful thinly sliced, cold-smoked Norwegian salmon to go along with it. No question, the combination was utterly exquisite. Preheat the oven to 400 degrees F. Butter the inside of a 2 qt. soufflé dish. Wilt the spinach leaves and the green onions, then squeeze together to remove moisture and chop thoroughly. Scald the milk. In a small pan over low heat, melt the butter; when it begins to bubble stir in the flour, and cook and stir for about 2 minutes. Remove from heat and slowly whisk the heated milk into the roux, then add the salt, nutmeg and white pepper. Return to heat; cook and whisk until it begins to thicken, 1 to 2 minutes. Continue to whisk over low heat for approximately 8 minutes ― until the whisk leaves tracks with sauce. Remove the sauce from heat and allow it to cool slightly, then whisk in the egg yolks, one at a time. Stir in the cheese and the spinach mixture and transfer to a large mixing bowl. The base can be held at this point until ready to finish the soufflé. Place the egg whites and cream of tartar in the bowl of a mixer with whisk attachment and beat on low for 1 minute. Add a dash of salt and increase speed slightly for another minute. Increase speed to high and whip until firm, shiny peaks form, approximately 1 to 2 minutes longer.